Larger-sized wipes for heavy-duty, multi-purpose cleaning. Uses Crystal Simple Green, a powerful, nontoxic and biodegradable cleaner and degreaser. Dual-sided wipes feature a scouring side for tough scrubbing and a non-abrasive, smooth side for a lint-free shine. Removes dirt, grease, oil, wet paint, tar, soot, carbon, graphite and much more. 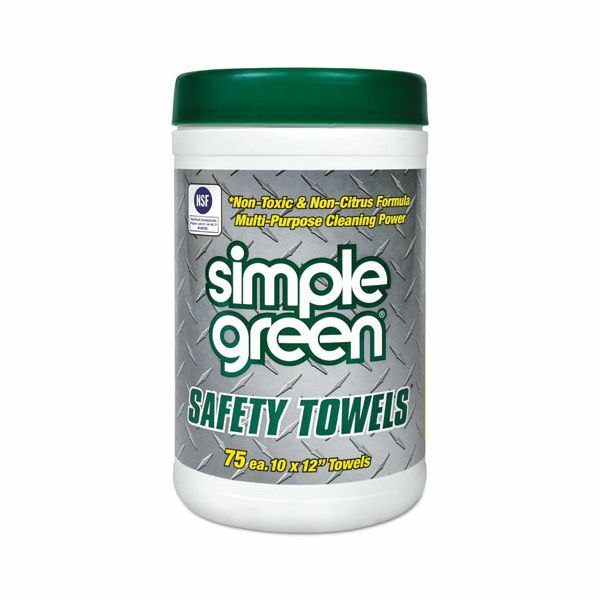 Simple Green Safety Towels, 10 x 11 3/4, 75/Canister - Safety towels with multipurpose cleaning power offer the quick, easy, safe way to remove grease, oil, wet paint, carbon, graphite, tar, soot, grime, most inks and other soils. Safe and effective on human skin, metals, finished wood, laminates, fiberglass, porcelain, tile, ceramics, concrete, terrazzo, carpets upholstery and more. 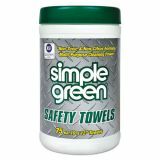 Safety towels are premoistened with nontoxic, biodegradable Crystal Simple Green. One side is nonabrasive. The other is abrasive for tough scrubbing. Safe for use on washable surfaces including metals, concrete, rubber, finished wood, tile, laminates, concrete, stone, porcelain, carpets and other industrial surfaces. Polypropelyne towels are thermally bonded and melt-blown to ensure durability. Excellent wicking and fluid holding capacity for cleaning liquid spills.